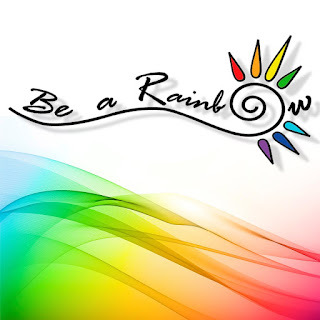 Church of Christ Lesbian: Be a Rainbow! Those that know me know I love rainbows. I am effectuated with them. On my personal computer, there is a picture of one and it says "Be a rainbow in someone else's cloud" by Maya Angelou. I think about this saying often. What does it mean? How can I be a rainbow? In life, there are many dark clouds that seem to pour on us, but we can be a rainbow to each other by encouragement and giving hope. I see a rainbow and it reminds me that the rain will stop and God's love that He won't flood the Earth. When being a rainbow to someone, it is reminding them that this will end and that God won't flood them where they can't survive. Do your best to be positive. We choose daily if we are going to be positive or negative. It is easy to get all wrapped up in the bad and let the flood of things get us down to where we are no good to anyone. Yet, if we look at the good, we will find that the storm ends quicker. And when we are being positive, we can be that hope to someone going through their own storm. Pray for good things upon the people who have storms going on. There is power in prayer! It can change things and people. God wants to be part of the rainbow making and He wants to hear from us. So don't only pray for the person, but that you yourself are a rainbow to others. Share your experience, strength, and hope with the person. Sometimes knowing others have gone through storms in their life and made it, helps the other person know that there is hope and that it will end soon. Give hope to people. Let them know that nothing is forever and that there is a good side coming. My preacher tells me that there have to be highs and there have to be lows, it's called life. And it tells you that you are alive. Think about it, do you want your heart rate to be flat? No, it has peaks and valleys that let you know you are ticking along. So remind people that there will be a bright side to the storm. Give them a hug. There is power in human touch and giving a hug will do a world of good. It says, "I am not alone!" And it allows the other person to let down their walls and release the negative and be acceptive to the good. Sure there are more things that you can do, but these are just a simple suggestions that could make the world of difference in someone's world. We all must do our part to show a loving concern for each person and be a rainbow in someone's cloud!